Dolphin Light - Click on an item for more details! This beautiful Lighthouse & Dolphin Candle Lamp is made of iron and stain glass with a door that opens from the front. The detail and hand craftsmanship is unparalleled. It is intricately detailed and distinctive to add beauty to your home or office. Stain glass/ Iron. 11" X 6"
This enchanting Lighthouse & Dolphin Candle Lamp will bring a unique and artistic addition to your home or office. 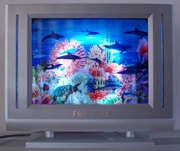 With bright, playful colors, this underwater scene will make a beautiful accent to any room. Makes a great gift for the ocean lover in your life! Stain glass/ Iron (bottom door) Size: 12.5" x 5.5"